Login to search with subscriber access or register for a new account. Anonymous users are required to complete the Captcha requirements for each search request. Registered users can login to avoid the captcha requirements. Last Name * Exact Last Name? If no dates are chosen, search will default to the last 30 days. The Secured Courts Online Record Search System is a public service provided for informational purposes. 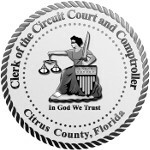 The Citrus County Clerk of Court and Comptroller shall not be held liable for use of any of the information provided on this site. By using the services provided by this site the user agrees to these terms.